Are you a sweet or savory breakfast lover? I could go either way honestly. I mean I love me a good oatmeal recipe or pancakes, or even a breakfast bake. 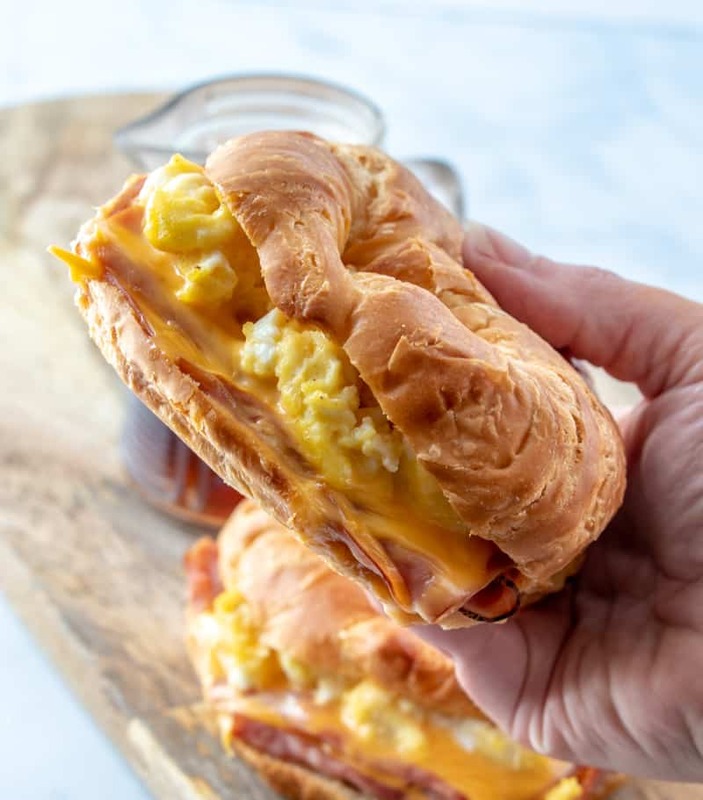 These Easy Croissant Breakfast Sandwiches are one of the quickest and easiest recipes you could ever think to whip up! Seriously. 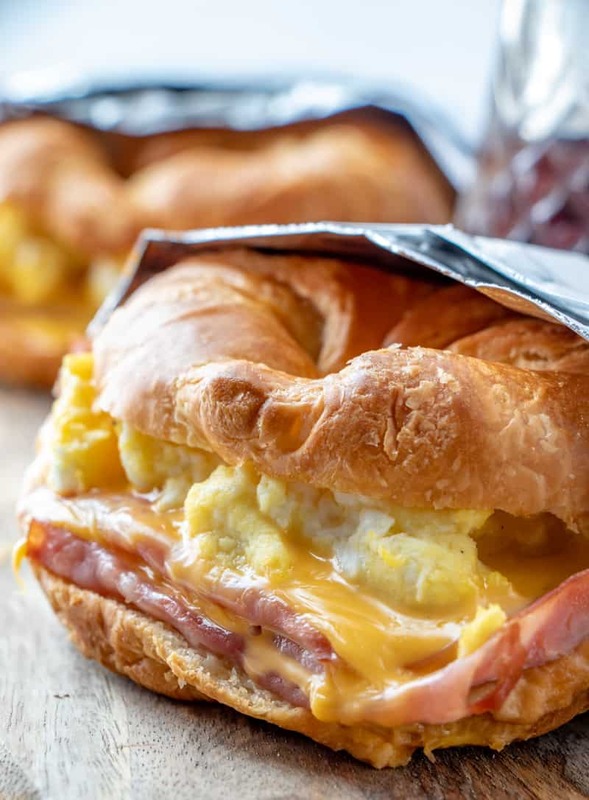 I’m slightly addicted to croissants, and when you stuff them with ham, cheese, eggs and a secret sauce it really pushes the breakfast game over the top. So I have to admit, when I eat my eggs, I eat them scrambled with cheese and covered in syrup. I usually get two different reactions when I tell people that. One is omg yum that sounds absolutely amazing and the other is ewe. But I’m more of the don’t knock it before you try it type of person because it is truly addicting. 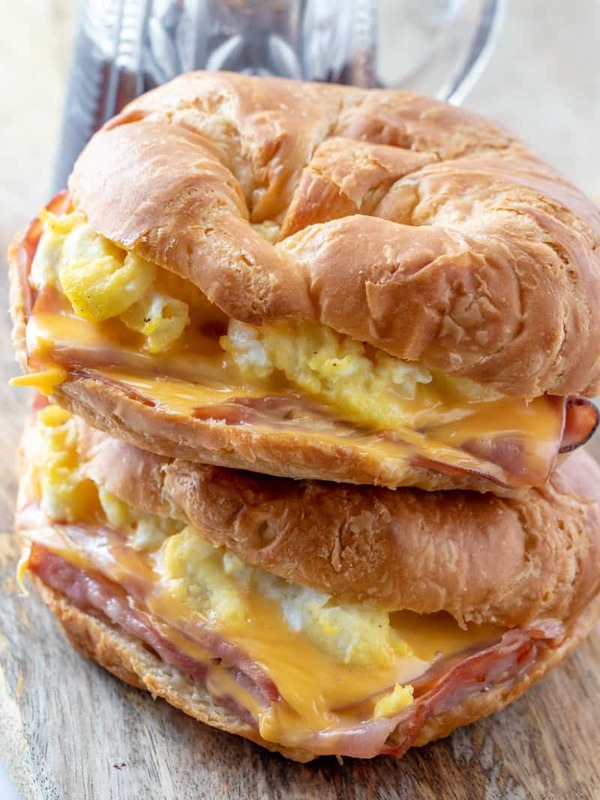 So when it comes to our breakfast sandwich recipes I love adding a little sweetness to them. I created a little sauce that you brush on the inside of the croissants that is made from butter, brown sugar and mustard. It really gives a nice little sweetness in every single bite, but doesn’t over power any of the other flavors one bit. So like I said I’m completely addicted to croissants, I mean I really like to eat them plan right out of the container fresh from the bakery. But love using them for breakfast. Don’t those all sound amazing? 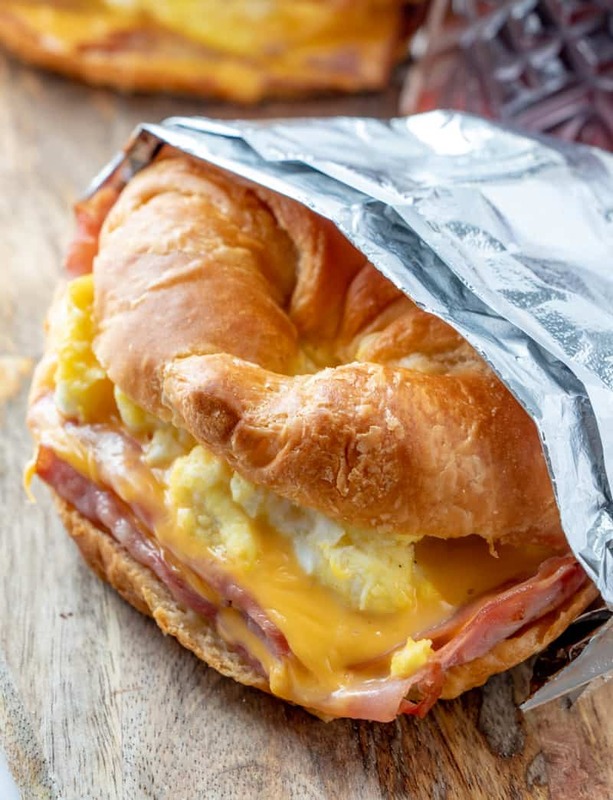 I mean seriously, but nothing holds a candle to these Easy Croissant Breakfast Sandwiches! Cook eggs according to your preferred doneness, set aside. Slice your croissants in half, set aside. In small bowl heat your butter and brown sugar until sugar is dissolved, stir in your mustard. Brush on one side of your croissant. Place about 4-5 slices of ham on bottoms of each of the croissants, top with a slice of cheese and top with 1/4 of your scrambled eggs. Place your other half of the croissant on top and wrap in tinfoil. Bake in oven for 10-15 minutes until cheese is melted. Literally this recipe couldn’t get any more simple than this. And everyone loves them. My kids ask for these all the time, and they inhale them so a lot of the time we do double the recipe since this usually only makes 4. We like to start off with smaller batches and work our way up from there. That is why we love this Breakfast Sandwich recipe because it can easily be doubled. Wrap in tinfoil, it helps to not dry out your croissants, but if you prefer a crispier sandwich then just place on baking sheet and bake. Use your favorite type of ham, we like to use honey ham as our choice. Use real cheese, we like a brand called Bongards and it’s not processed, using Kraft singles or the like won’t produce a really melty cheese. Add some cheese to your eggs to make it even more cheesier. Add a slice or two of bacon to kick it up a notch! 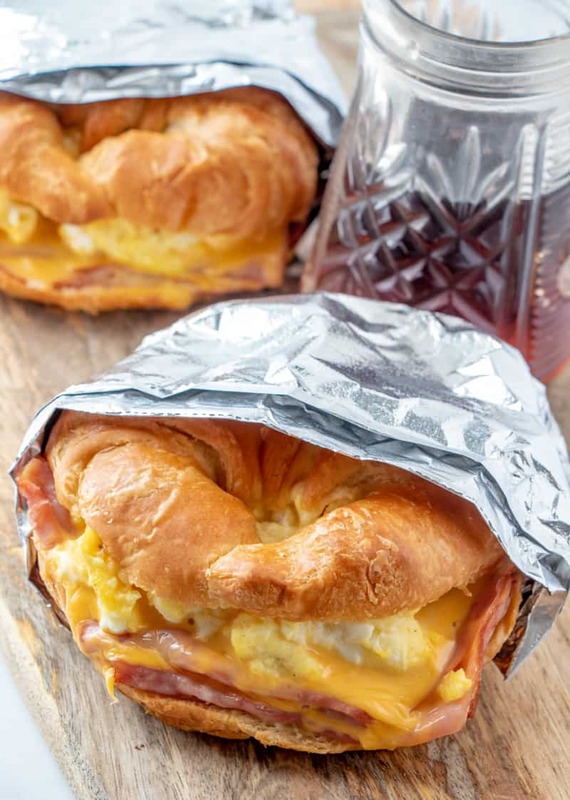 If you are looking for the perfect mean these Breakfast Sandwiches are absolutely an easy and amazing solution. Quick, easy and you won’t find someone who won’t enjoy these. Preheat oven to 350.Cook eggs according to your preferred doneness, set aside. 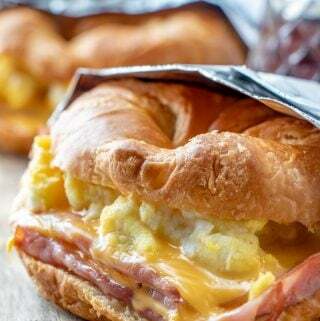 Brush on one side of your croissant.Place about 4-5 slices of ham on bottoms of each of the croissants, top with a slice of cheese and top with 1/4 of your scrambled eggs.